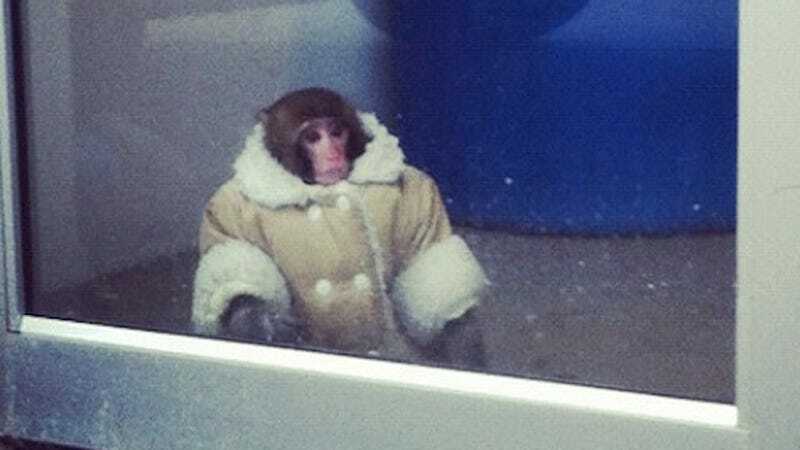 This past Sunday, a seven-month-old rhesus macaque, wearing a solitary Ugg boot as a jacket, was found wandering an Ikea parking lot in Toronto. It caused quite a stir as you don't see a primate in a baby-sized shearling coat roaming through Grönkulla towel sets and Knutstorp wicker baskets everyday. Not quite as adorably funny is the fact that it's illegal to keep a monkey as a pet in Toronto, and so Toronto Animal Services seized Darwin from his owners, who recently brought the monkey from Montreal, were fined $240. Which, fine, but I feel like they should foot the bill of his relocation and life at sanctuary, right? Speaking of, Darwin was transfered to Sunderland, Ont. 's Story Book Farm Primate Sanctuary, where he'll live out the rest of his life in a sanctuary. "These animals are not meant as pets. They're not meant to take the place of a child," sanctuary founder Sherri Delaney said. "Did he need to be in a coat? No, he didn't. Did he need to be in a diaper? No." According to the National Post, Darwin will be paired up with a "motherly" monkey at the sanctuary, and live among two Japanese macaques and two more rhesus monkeys, who are soon expected to arrive at the sanctuary from lab situations in the Greater Toronto Area.